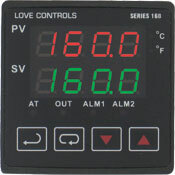 Monitor and control temperature or process applications with precision using the Series 16B controllers. The units offer two separate outputs for dual loop control in direct or reverse acting. Select relay, voltage, or current output combined with a second relay output. The Series 16B provides dual LED displays for local indication of process value and setpoint value. Output status, engineering scale, auto tuning and alarm status is also indicated on the front panel.